You will be given a reference e-book to read which has 485 &nbsp; pages And the test will be based on that e-book , you can take the test only after 10 days Of &nbsp;purchase. Teaching is one of the most noble professions which a person can choose to pursue. There is an old misconception that those unable to perform in a field teach it. This is not even remotely accurate. In an ideal world, where academia is regarded and treated with the respect it deserves, the very best and most brilliant minds in any field or profession should be the ones who teach the generations to follow them. In a society that values technological progress and growing industrialism, the field of science is one of the most important to teach to current and future generations. The progress of man, from art and philosophy to religion and craftsmanship all depend on a core scientific knowledge, and a pursuit of the understanding of the nature of the universe itself. Therefore, as important as the skill of teaching itself is, in conjunction with the importance of the noblest of philosophies, science, the art of teaching science is an important subject, that requires the best minds to devote themselves to. Science is a word that stems from an ancient reached term meaning and understanding of the rules and nature of the environment around you. In modern times, science is a word meaning the use of logic and observe rules through experimentation to understand and explore the universe in order to utilize its innate nature, for the benefit of society. Many people often associate science with common tropes such as chemistry, mathematics, engineering, computers and other such topics. People do not realize that almost every facet of mental discipline known to humanity is a form of science. It is therefore a bit of a tricky thing to have a general and comp to grasp of teaching science. However, that does not mean that it is in any way impossible. The most intrinsic and complex thing to learn when taking a teaching science course is the psychological and sociological aspects associated with any form of professional teaching. Teaching is very much sociological and psychological just as much as it is about the dissemination of data to receptive minds. A mindset of caring, human interest, and not was patience are the secret to a successful teacher. Those who do not like to teach definitely should not. This is a profession that requires a passion for both the material involved, and the act itself. Given that science is an abstract concept, it's fortunate that such things as the scientific method exist, which allows a teacher to get a basic foundation set forward for how science in general works, before exploring various specialized aspects of science in any given topic. The best channel for acquiring a teaching science certification is online certification. Online certification is the most cost-effective, time efficient and convenient method for adult learning. A student can learn at their leisure, allowing much time for their personal life and their existing professional life. Costs are reduced by removing expensive textbooks and costly tuition fees. The stress reduced by this, a student is at ease, receptive and ready for the innovative learning system that Brainmeasures is about to show them. Brainmeasures is one of the most innovative and experienced online certification providers in existence. We use an innovative method coupled with a unique philosophy that allows us to ensure that our students, upon completing our certification test, are as ready for the field as they could possibly, humanly be. How do we do this? Here at Brainmeasures, our philosophy is that intrinsic information by itself is useless, requiring experience as a glue to hold the structure together. Unfortunately, there is no way for a newcomer to a field to have traditional personal life experience in this craft. However, we have worked out a way to solve this problem. We work closely with professionals in any field, upholding them to ISO standards, and allow them to impart upon us their experience from working in a field for many years. We take their experience, and we cited through example and practical demonstration in our courses. 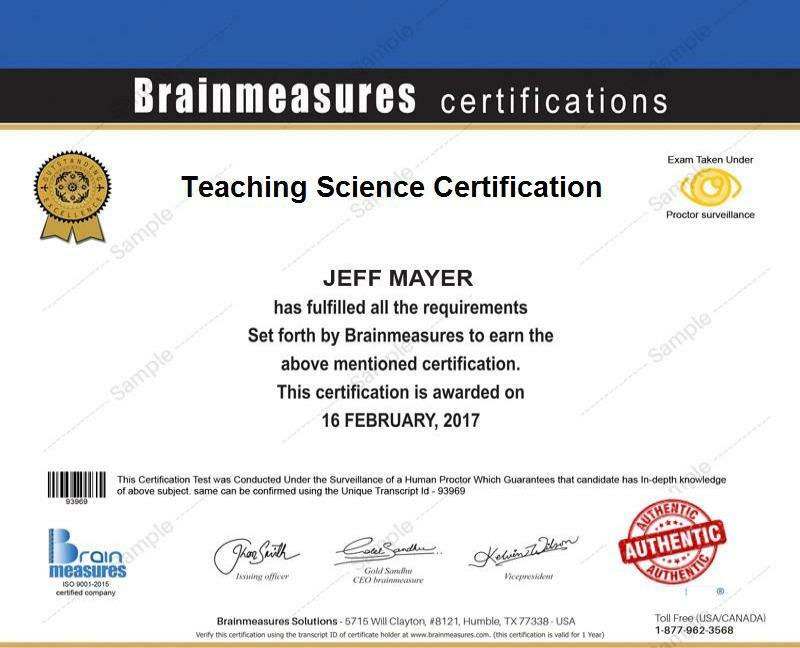 Upon receiving a skill certificate from Brainmeasures, a student has a foundation of experience from those who have worked in the field before them, something no other online certification provider is even willing to attempt to do. Students may read this teaching science course at their leisure. Upon completing the course, they will take a teaching science exam, which is our certification test. Upon passing this test, they will receive a skill certificate stating that they are not only qualified to teach science, but they are potentially among the best science teachers that the planet has to offer. Only Brainmeasures skill certifications can guarantee this with such confidence. The above list is the four basic topical sections of our teaching science course. Within each of these topics, is a plethora of more subtle and specific aspects of the art of teaching, as well as the nature of science, which any competent science teacher must know as gospel. We left no stone unturned, noting both the failures and successes of past science teaching, so that students may learn both what does and does not work. This course is designed so that anyone with a passion for teaching and a passion for the sciences may readily enter the field. Truly, power and innovation that is Brainmeasures. However, there are a few attributes, by way of personality, that will determine the likelihood that one is meant to be a teacher. As said before, patience is a virtue that is necessary when teaching. Even the brightest dude will stumble and have difficulty with some topics. They may ask the same question multiple times, and they may even ask questions that to the teacher can offhand sound unintelligent. But remember, there is no such thing as a stupid question. A passion for people and an understanding of human nature is very important when teaching as well. In many cases involving teaching, a patience and even a love for children can be very necessary. This love and patience with nurturing children can also transfer over to teaching adults, as an adult in a learning environment must assume a sense of innocence and naïveté before they can become receptive to new ideas. When it comes to teaching science, and intellectual an orderly mind is important or teaching such a profound, and diverse subject. If all of these innate features, or at least some of them are part of your mental composure, then we guarantee that this course will give you the wings, you need to fly. Many of these professions can earn up to $80,000 a year, with complete benefit packages and even tenure.